It would almost be understandable, as busy as we all are in these times, to allow a slightly frivolous tradition to slip. You get busy. There’s only so many hours. There’s always next year. Which is what made Friday at KDC so great. For the last several years, we’ve made Halloween our holiday. Each team decorates their part of the office, the costumes get broken out, someone famous stops by at lunch to judge our costume contest and our kids and those of our friends go office-to-office trick-or-treating. We could have let all the things on our collective to-do list temper this year’s celebration. But no way. The costume contest was bigger – and more inspired – than ever. Our special Celebrity Guest Judge was Mirage headliner Terry Fator, who took his role seriously and couldn’t have been nicer. 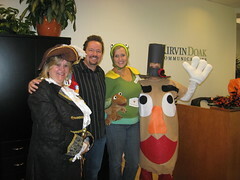 Debbi Medsker as Mrs. Potatohead took top honors, followed by Ashlee Miller as Winston the Puppet from Terry Fator’s show (taking “sucking up to the judge” to new heights) and Judy Chappell as a wicked pirate taking third. We also had an awesome Kenny Powers (Brad Seidel) a fashionista nun (Claudia Cogburn), some evil surgeons (Kala Peterson, Lindsay Rathjen and Melanie Shafer), “Blackmail” (a very clever Liz Lundstrom), Jamie Oliver The Naked Chef (Bonnie Smith) and two frat boys who used their costume as an excuse to have beer (Craig Nyman and Matt Guidish). Young trick-or-treaters came by to make Mr. and Mrs. Pumpkinhead toys and put their hands in some brains and innards and eyeballs. And they made off with a lot of candy, too. Take a look at the photos. Yes, it actually was as much fun as it looks. And if you’re in the neighborhood next year, stop by. It will only be better. To see more photos of our party, check out our Flickr album.